Determining appropriate stocking rates does not have to be complicated. Photo courtesy of Jace Stott. A common conversation I have with producers usually goes something like this, “I’m renting out 50 acres to my neighbor who wants to run 30 cows on it, does that sound about right to you?” This is a perfectly legitimate question, however, more details are needed on both the cattle and the pasture to fully answer this question. Determining appropriate stocking rates can seem daunting to some producers because, like me, they probably have less than fond feelings towards mathematical calculations. However, determining appropriate stocking rates does not have to be complicated. The key is remembering two main elements required for stocking calculations, Forage Demand and Forage Availability. When calculating stocking rates, keep the big picture or main elements in mind, those being FORAGE DEMAND and FORAGE AVAILABILITY. This is intuitive, even in a simplistic stocking question like the example given above, the producer recognizes that there has to be some sense of demand (30 cows) and availability (50 acres). All subsequent information required to calculate appropriate stocking will fall under the categories of FORAGE DEMAND or FORAGE AVAILABILITY. 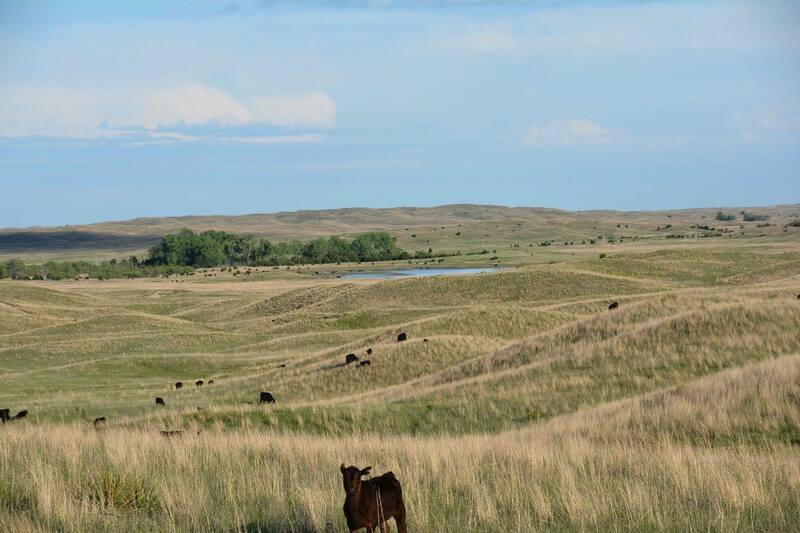 Though many aspects of stocking can be calculated (see this tutorial for stocking calculations), many producers just want a basic idea if they will have enough feed for the number of cattle they are grazing. The purpose of this article is to provide an example on how to do a quick and basic comparison of forage demand and forage availability. Calculating forage demand captures three important elements animal size, length of time grazing, and number of animals. Animal size is taken into account using an Animal Unit Equivalent (AUE). The AUE is an estimate of the amount of forage an average cow will eat. The baseline for the AUE system is a 1000 pound (lb) animal, in other words, a 1000 lb animal equals 1.0 AUE which will eat on average 680 lb of forage (Dry Matter) or 780 lb of forage (Air Dry). Each hundred pounds over or under the 1000 lb baseline is either an addition or subtraction of 0.1 (e.g. 1100 lb cow equals 1.1 AUE). To combine AUE with amount of time grazing and number of animals grazing one simply needs to multiply. For example, if 30 cows weighing 1200 lb were grazing for 6 months the forage demand equation to calculate Animal Unit Months (AUM) demand would look as follows: 1.2 AUE*30 head*6 months = 216 AUM’s. This is our demand. Forage availability calculations requires a little more research. The productivity of a given piece of land is dependent on site characteristics which vary with location. Certain generalized guidelines exist to help producers estimate their AUM/acre depending on the location of their property. These guidelines can be found on the stocking calculations video in the above web link. These are generalized estimates and may not be representative of your property. To gain more accurate data for your property’s forage availability there has to be some estimation of forage production as a starting point. If your pasture was previously hayed use production records to calculate the average forage production (lb/acre) of previous years. Clipping forage inside the dimensions of a small frame or hoop is the most common method for determining forage production if no previous production records exist. Figure 1 shows different frame/hoop dimensions and their conversions to lb/acre. Try to clip at least 10 to 20 frames/hoops in areas that are typical of the pasture. After clipping, forage should be dried (for calculating on dry matter basis) and weighed in grams (remember to take into account weight of sample bags!) average your sample weights and use the conversion factor in the above link to calculate lb/acre. Pounds/acre of forage is multiplied by 25%, this takes into account 50% utilization as a proper grazing practice to leave enough residual for plant vigor, and 25% of remaining forage which is not ingested due to trampling or insect damage (e.g. 100,000 lb of forage will more realistically be 25,000 lb of forage available for grazing due to this calculation (100,000 lb*0.25 = 25,000 lb)). After available forage is determined, calculate how much a cow will eat per month to find the AUM’s for forage availability. A common standard is a 1000 lb animal will eat 780 lb of air dry forage per month. With forage production and amount of forage consumed per month per head we can now calculate the AUM’s for availability. Simply divide the available forage by the pounds of forage consumed by a single animal/month (e.g. 25,000 lb available forage/780 lb forage consumed by one animal in a month = 32.1 AUM’s). This is our availability. Figure 2 is a diagram to show the progression of calculations comparing forage demand AUM’s to forage availability AUM’s. For the sake of this diagram, we will use the example of 30 cows weighing 1200 lb grazing for 6 months on 300 acres of upland pasture which produces 2000 lb of forage per acre.